Chop KIT KAT bars into teeny tiny bits, about 1/4 inch. Beat butter, granulated sugar, brown sugar and vanilla extract in large mixer bowl until creamy. Add eggs, one at a time, beating well after each addition. Gradually beat in flour mixture. Stir in half the KIT KAT morsels, saving the other half to add to tops of cookie dough prior to baking. Drop the dough by rounded tablespoon onto ungreased baking sheets. Bake for 9 to 11 minutes or until golden brown. Let cookies cool on baking sheets for 2 minutes and remove to wire racks to cool completely. 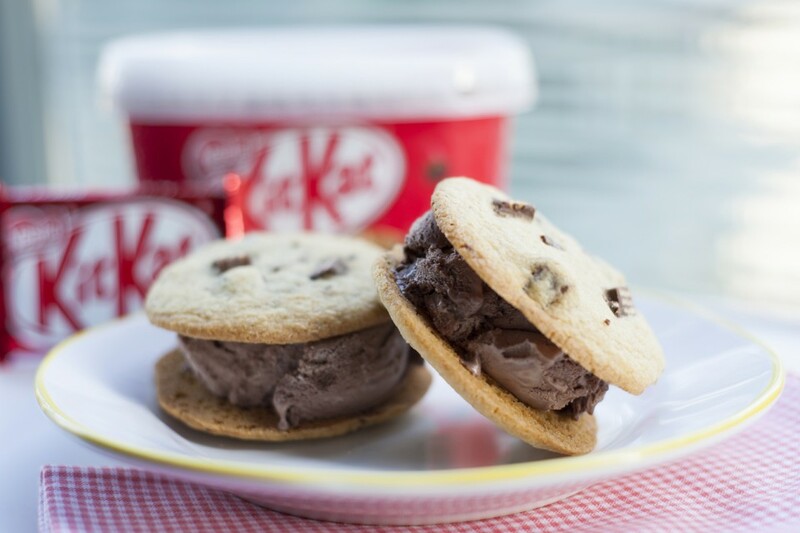 Place one scoop of Nestlé Kit Kat Frozen Dessert between 2 freshly baked cookies and enjoy. Your KIT KAT dreams have come true! To keep your treats from melting quickly, cool your cookies fully before making your sandwiches. Try this recipe with KIT KAT Cookies & Cream bars for a double-dose of cookie.